Sitting on a 1700sq.m site overlooking the harbour around Fisher Bay, the design for Link House capitalises on its extensive views, has very strong architectural geometry and is exceedingly well balanced in its scale. Shaded 6m high windows allow lots of light to permeate through the house and enormous void spaces inside allow a meditative and grand effect. 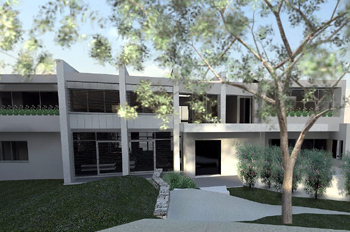 This house is in Sydney's Clontarf on a large 1600sq.m site that embraces the harbour around Fisher Bay. 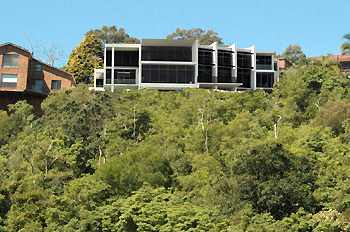 The house sits proud among its neighbours looking over The Spit Bridge and beyond. The design capitalises on its extensive views has strong architecture geometry and is exceedingly well balanced in its scale. Blades help focus different areas of the house to different views with larger void spaces inside. The street side of the house is very private accessed only through an old tramline. The strong blades traverse from one side of the house over the roof to the other side. 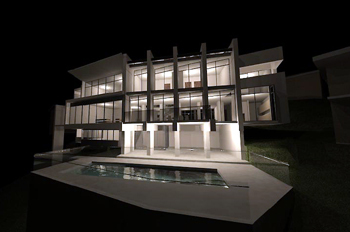 A rendered view of the house provided to the client prior to construction. The kitchen has a separate butlers kitchen to the side. The main kitchen is unfettered with clean lines throughout, reinforced by the ceiling concealing air conditioning services. 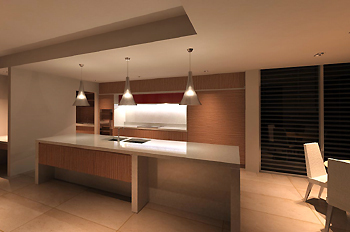 The kitchen has Gaggenau appliances, a mix of pendant lights, strip and LED downlights and full timber cabinetry. 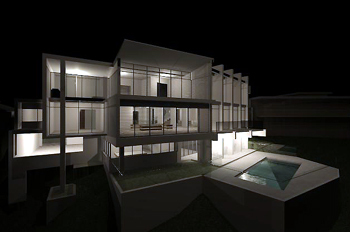 A rendered view of the house showing its extent. 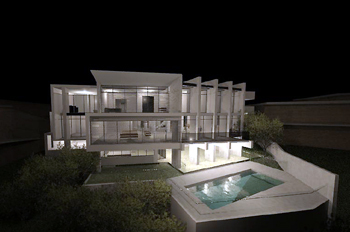 A main bulk of the house seems to float at its central part and the pool is saluted by the strong linear forms of the blades wrapping themselves around and over the house. 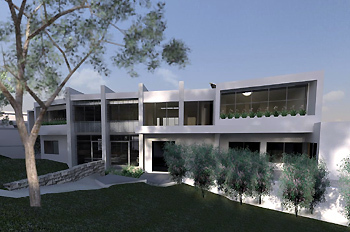 A rendered view of the house showing its extent. The blade walls resemble upright stacking cards as they diffuse light from different directions. The blades are shown backlit and with great eminence and allow a strong geometry to permeate through the design. Site features: land rises sharply from harbour. Expansive views of harbour including Spit Bridge. Architecture highlights: Light filled interiors with 6m tall windows, sustainability and green credentials are led by its passive and active design. Strong geometry and design cohesiveness.